Well, once again, I made it to bed on time, but not early. Oh well. Hopefully today's gig will go okay! 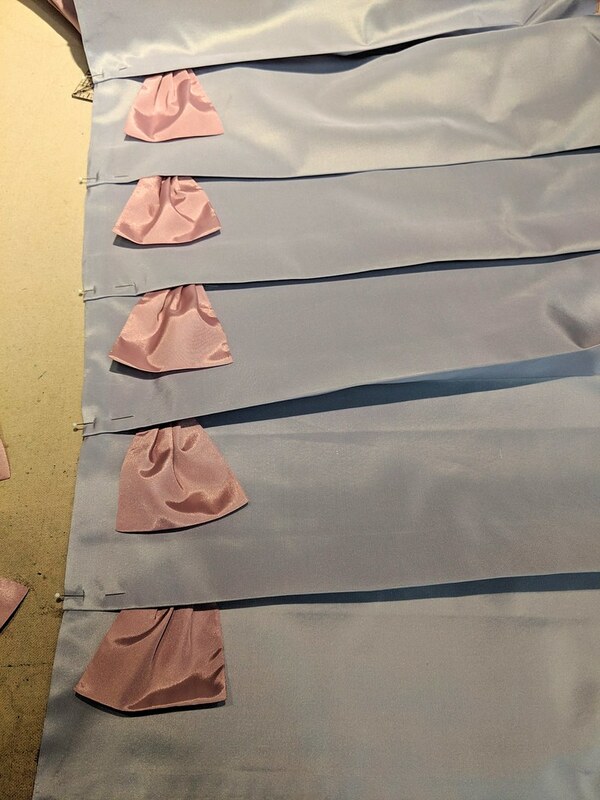 I pleated up the lower tier for the skirt, and I made all the little half-bows that go into each pleat. So now I just need to figure out how to attach it. I'd really rather do it by machine, but obviously then there will be visible stitching, so I may have to do it by hand. :( I also sewed the two layers of the top tier together, but have not yet turned/pressed/pleated it. I did get the bias on the ballgown neckline, though. I don't think I'll really have sewing time tonight, because I'm seeing several friends in a show, but I'm hoping that I might have a little time tomorrow. I'd really love to have time to actually put my corset on and try out the sleeve mockup on the evening bodice. And probably redo it a whole bunch of times, as is so apt to happen when dealing with sleeve mockups. VicFest is only two weeks from tomorrow, and I'm really starting to feel the crunch!